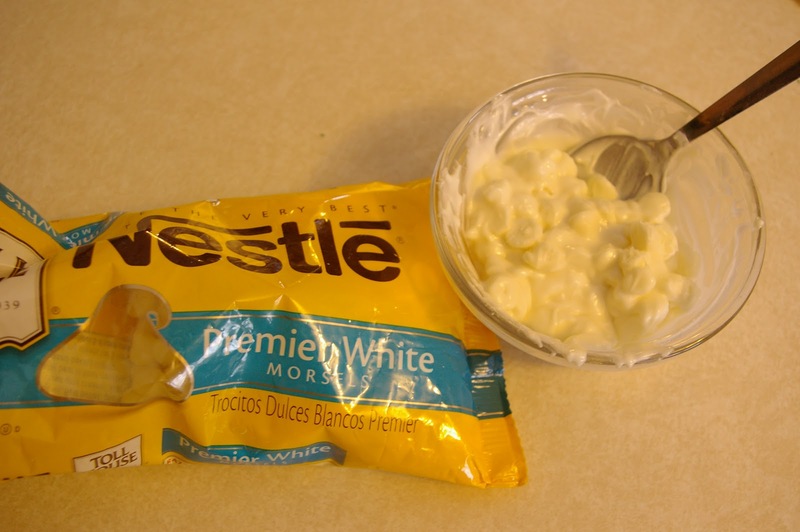 Place about 1/2 cup of white chocolate chips in a glass dish, and microwave for 30 seconds at about 50% power. Stir. Do this two or three times, until you are able to completely melt the chips. DO NOT OVER HEAT! You should be able to stir the chocolate smooth and free of lumps. 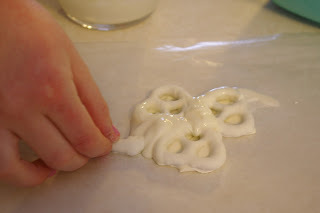 2) Line a surface or baking sheet with wax paper. 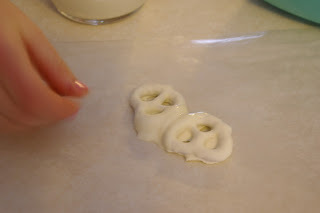 3) Dip the bottom half of a pretzel in the melted chocolate, making sure each side is nicely coated. Place the pretzel onto your wax paper. 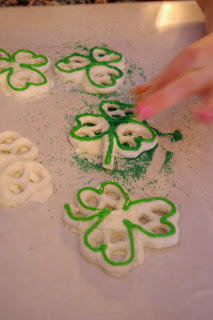 4) Repeat Step 3 with the second and third pretzels, laying each to form the shape of a shamrock. 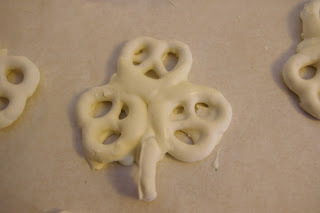 5) If you have broken pretzels, you can use them for the stem of your shamrock. If not, you can carefully cut pretzels like we did below. 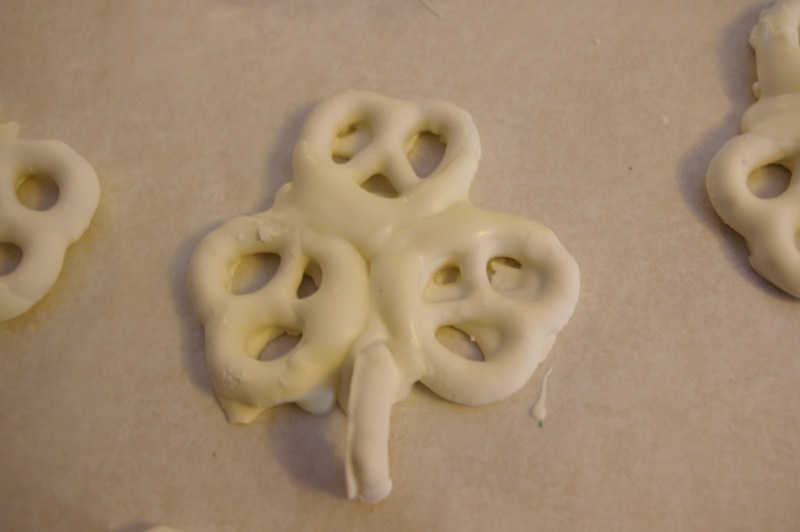 6) Dip the end of the shamrock stems into the melted chocolate, and put into place on the wax paper. Here is what your shamrocks will look like when assembled. Some of them, we chose to lay the stem flat, while others (like this one below) we had placed so that it stood off of the wax paper. And we thought we'd try to to make some four-leaf clovers while we were at it... of course, right? 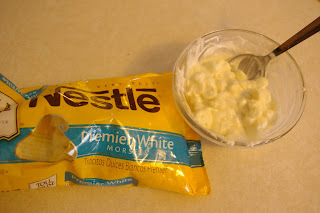 7) Time to mix up some frosting! 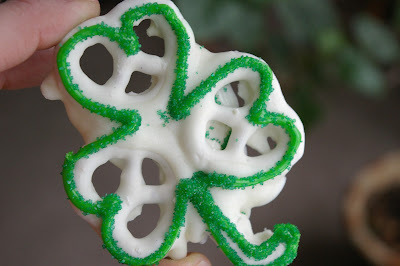 I used a great Sugar Cookie Icing recipe from Allrecipes.com, found HERE. 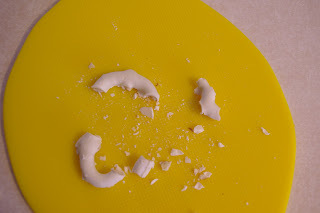 I like this frosting because it sets hard, and is easy to whip up. I doubled the recipe, and found that I had twice as much frosting as I needed. 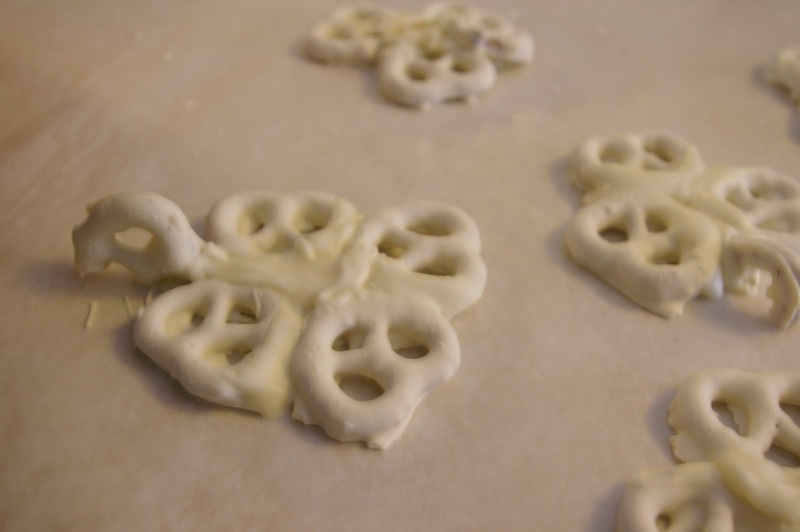 So if you use one package of yogurt pretzels, you can expect to follow the recipe as it is written. I added it to a piping bag with a small tip, but you could just as easily use a Ziploc bag and cut a small tip off of the corner. 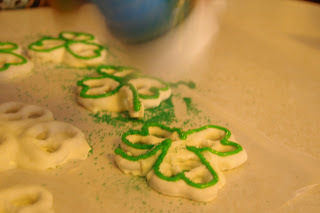 8) Outline your shamrocks with the icing. Add your sprinkles soon after, before the frosting begins to set! Baby It's cold out there!!!! 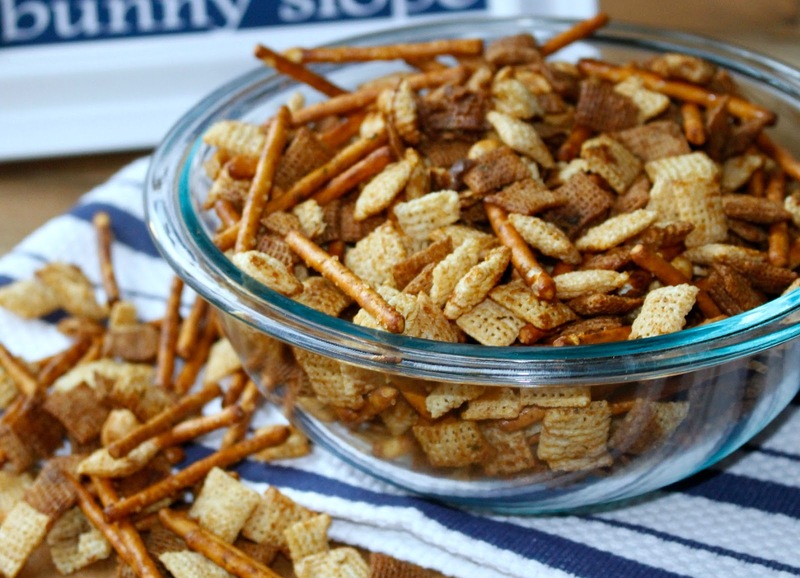 Combine cereal, nuts, and pretzels in a bowl and set aside. Stir together the remaining ingredients. 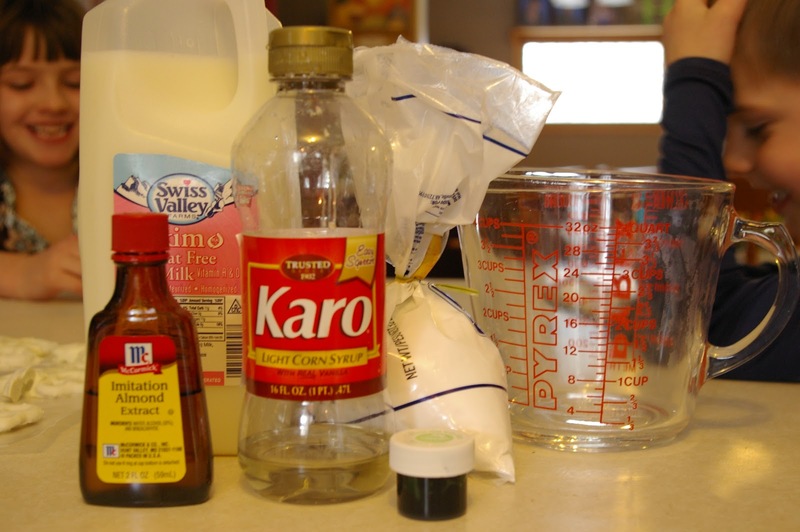 Once combined, gently stir the liquid mixture into the cereal mixture until well coated. 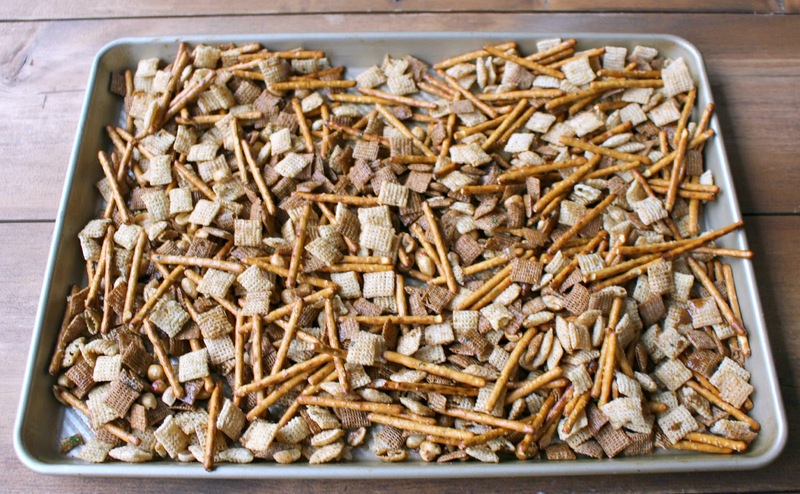 Pour mixture onto a jelly roll pan or 13x9 baking pan. Bake at 250 degrees for 45 minutes, stirring every 15 minutes. Spread of paper towels to cool and store in an airtight container. Now that you have the perfect winter snack you will want to grab some sunscreen to help protect our children from the bright suns ultraviolet rays. Dressing in layers will help keep us warm. Its a good idea to use enough layers so that if the top layer gets wet you can shed it and still stay warm. Cotton clothing is not the best idea as it does not keep the body very warm. Wool, denim and other fabrics is perfect for layering. Long underware, turtle necks and sweaters are perfect for layering and helping to keep you toasty warm. Warm socks and boots are also part of the cold weather attire and to top it all off a hat will help keep the warmth in. Presidents Day is always on the third monday of February. This year the date falls on February 16th. President's day combines both George Washington's and Abe Lincoln's birthday and was established in 1968 when it was decided to change several federal holidays. The idea was to establish this law in 1971 so that all would fall on a monday and create a three day weekend. Presidents day was created to pay honor to all the men who have served as president. Honor the Presidents of our country with a patriotic parfait. Pick up strawberry jello, blueberry and cool whip at the grocery store. And celebrate the Presidents with your kids. Have a prize for the kid that knows the most about our countries great leaders. Make Jello as directed, chill for at least 4 hours. Spoon 1/4 cup Jello into each glass. 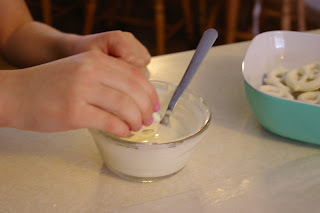 Then spoon in 1/4 cup cool whip over Jello and smooth tops. Slowly spoon 1/4 cup Jello over cool whip in each cup (you will use up Jello) and chill until firm, 2 hour. Top with final layer of cool whip. Divide blueberries among parfaits and serve. 1. 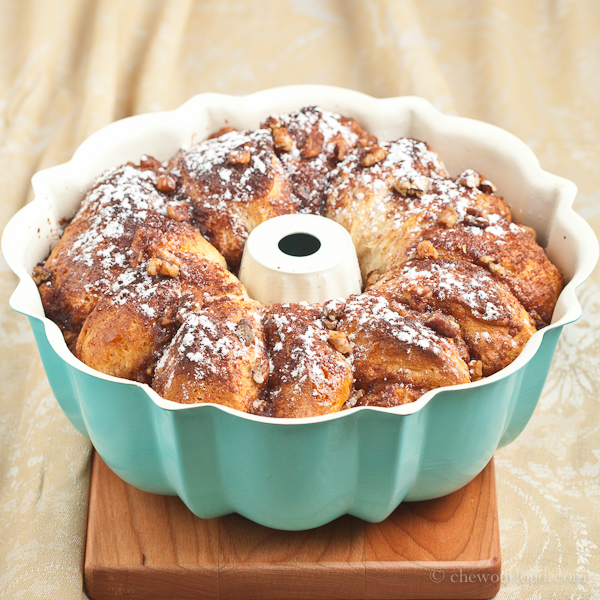 In a large bowl, cream shortening and 3/4 cup sugar until light and fluffy. Beat in extract. Combine the flour, baking soda and salt; gradually add to creamed mixture and mix well. Stir in gumdrops. 2. In a small bowl, beat egg whites until soft peaks form. Gradually add remaining sugar, beating until stiff peaks form. Fold into dough. 3. Drop by heaping teaspoonfuls 2 in. apart onto ungreased baking sheets. Bake at 350° for 12-15 minutes or until golden brown. Cool for 1 minute before removing from pans to wire racks to cool completely. Yield: 3-1/2 dozen. With all the love in the air for valentines day. 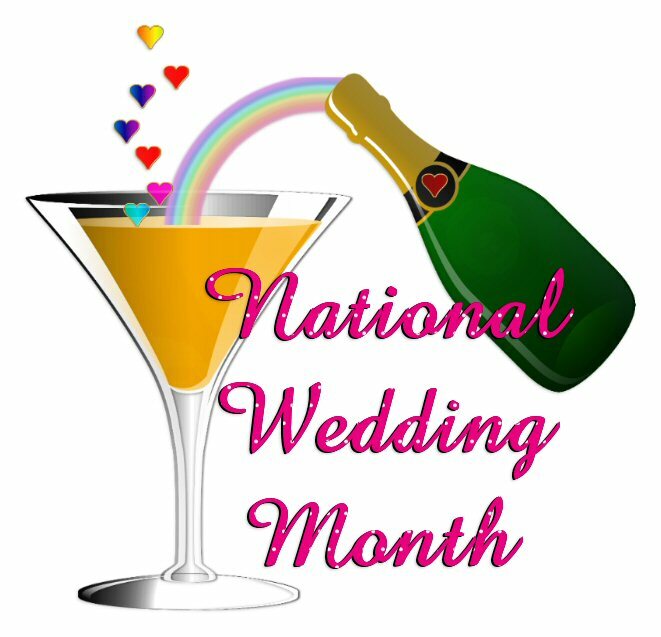 It seems no surprise that this romance month is also the National Wedding Month. In Most of the country it is frigidly cold and romance helps keep it warm but I would have thought that one of the spring or early summer months would have been the date to celebrate such an occasion. However, I was wrong and the romance brings about a loving moment of a wedding. Our family will be the guest to several weddings this year, (4) in fact or at least we think so. Our middle daughter will be the bride to an out door wedding in the Cave In Rock state park here in Illinois with a pirate kind of theme but a ready to rumble theme as well. She is in the process of making all of her decor , invitations and everything. We will celebrate with a spring picnic theme. My youngest son recently asked his gf for a few years to marry him but they have not set a date and are not sure if it will be soon or not. I just know that whenever it happens they will be ready and I will be helping whereever needed.